The Pompano Beach is an elegant redesign of a classic Roman Pool Shape. This beautifully designed fiberglass pool includes a wide deep end bench & curved entry steps. It’s standard hopper layout is a classic presentation of shallow end to deep end layout. Perfect for your traditional consumer! San Juan Pools has done it again! This time with a redesign on a classic Roman Pool Shape. 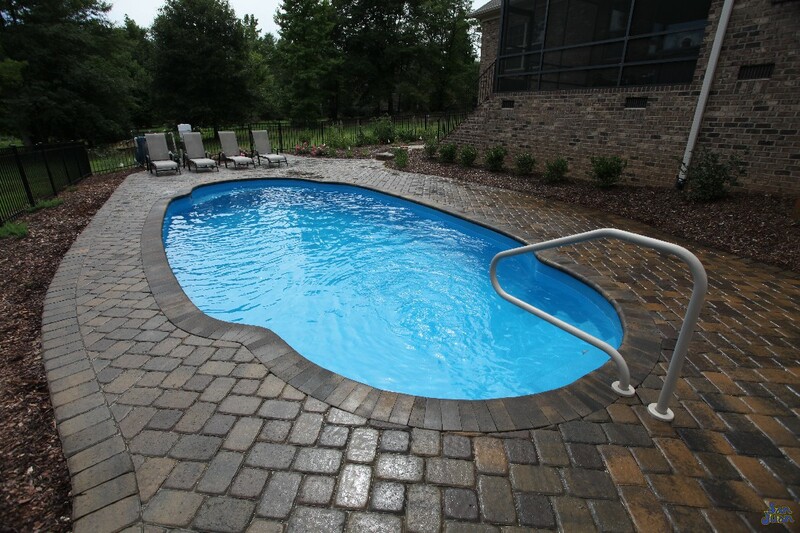 By design, roman pool shapes are intended to have a rectangular shape with curved ends. Often roman shapes utilize a mixture of standard hoppers or Sport Bottom Hoppers (deep end in the middle). 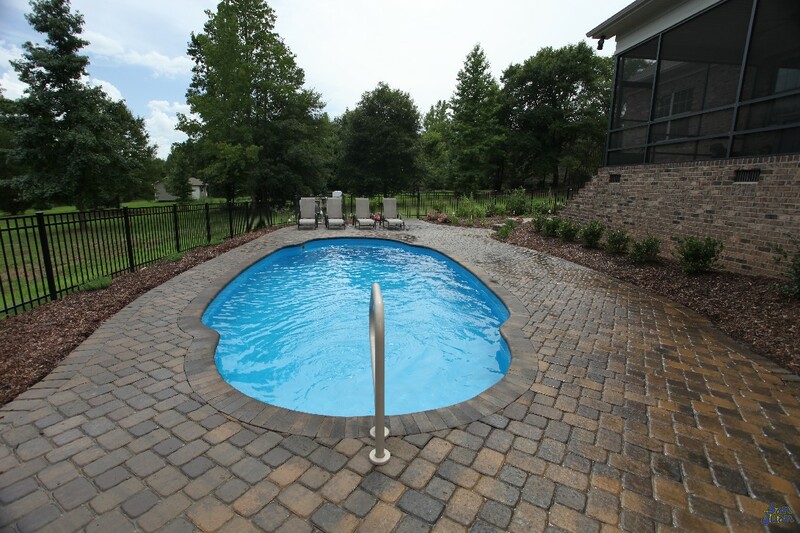 We offer variations of both layouts as part of our wide offering of 100+ Pool & Spa Shapes. For a great example of what a classic roman pool shape looks like, we invite you to check out the Caesar’s Palace! Now, getting back to the Pompano Beach. Our main deviation from the classic roman pool shape is two fold. For starters, the Pompano Beach uses curved sides rather than straight rectangular sides. This provides the swimmer with greater area to spread out due to its oval layout. Secondly, the Pompano Beach has a wide set of entry steps mimicked by a curved deep end bench. Both are great places to relax and provide optimal space for multiple users to relax. 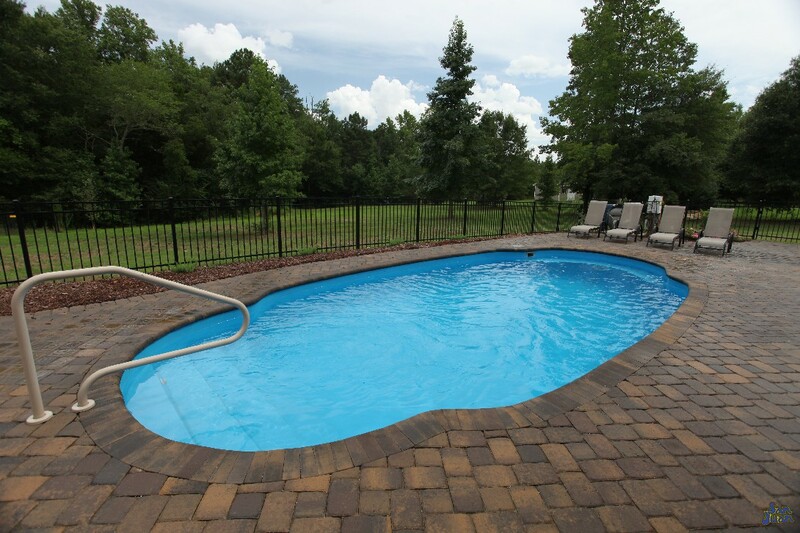 This beautiful fiberglass pool shape is perfect for your traditional consumer. 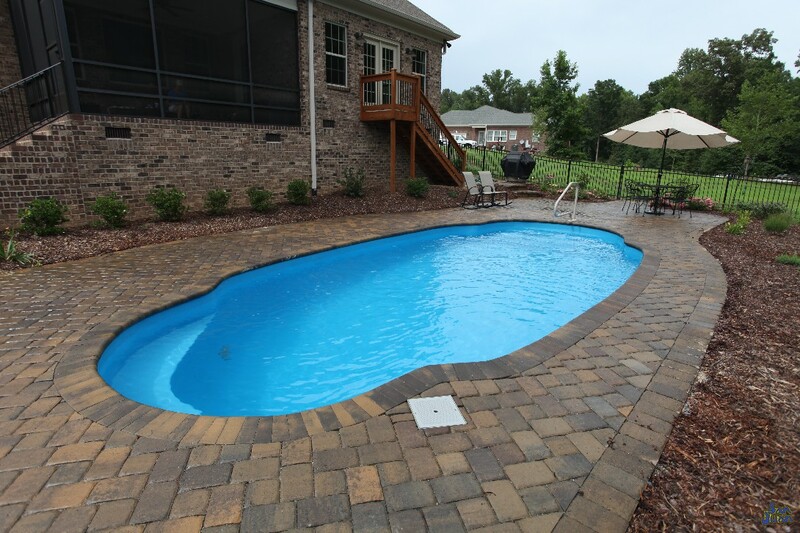 It’s standard shallow-to-deep end layout is a comfortable design that many are accustomed to. Enter into the stunning Pompano Beach for a nice soak and wade out to it’s maximum depth of 5′ 5″. Not too deep and very comfortable for most swimmers. The Pompano Beach is designed as a inviting pool that is both spacious and soothing. You’ll love it’s calm waters and the way that it beckons you into its gorgeous blue waters! In addition to the Pompano Beach’s gorgeous oval layout, this fiberglass pool is spacious for some serious fun! 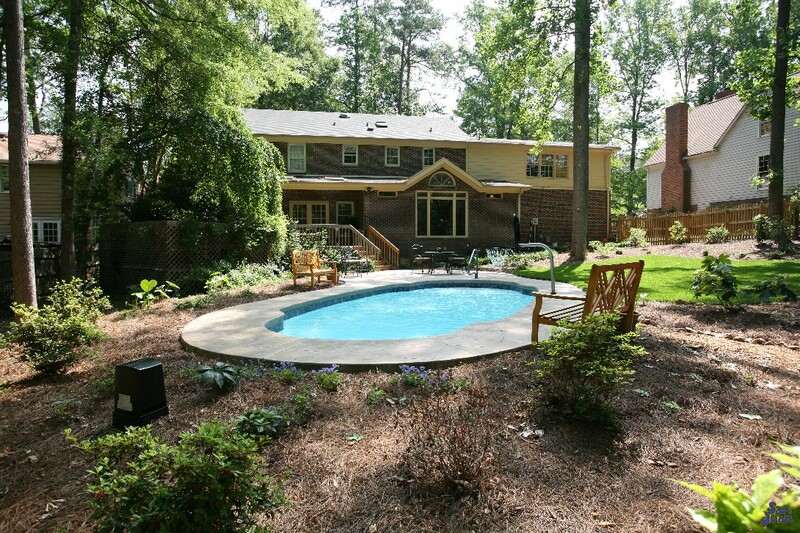 We recommend this swimming pool for consumers with medium and large sized backyards. It’s overall size of 302 SQFT will take up a modest amount of real estate. 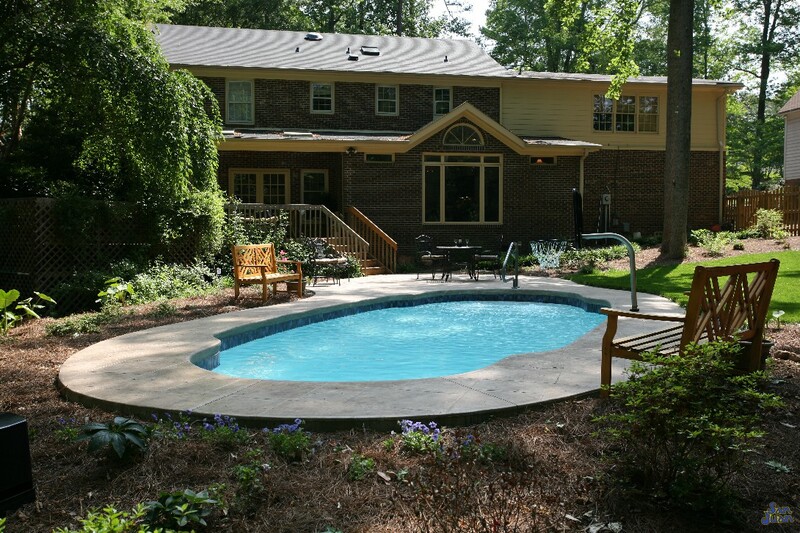 In addition, we consider this a medium sized swimming pool due to it’s total water volume of 9,500 gallons. Therefore, the Pompano Beach provides a spacious perimeter with lots of room for patio furniture. Your guest will love having plenty of room to spread out and enjoy the stunning views of this traditional fiberglass swimming pool. In conclusion, we recommend the Pompano Beach for consumers with traditional tastes. This swimming pool is a fun twist on your roman pool shape. The Pompano Beach provides a traditional shallow-to-deep end layout that many consumers are accustomed to. Therefore, if you’re looking for a fun fiberglass pool shape for your backyard, the Pompano Beach is a great choice!